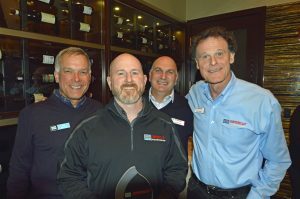 February 26, 2019, Bethany, Conn. — LATICRETE, a leading manufacturer of globally proven construction solutions for the building industry, recently celebrated top LATICRETEⓇ SUPERCAPⓇ self-leveling underlayment (SLU) applicators with its second annual Applicator of the Year and Spirit of SUPERCAP Awards. Mike Florentino, the President of NextGen Ready-Mix in New York, was honored with the Applicator of the Year Award for the company’s year-over-year growth and achievements using the LATICRETE SUPERCAP System. Last year’s Applicator of the Year Award winner Paul Pappalardo, Operations Manager for Allegheny Contract’s Surface Prep Division in Boston, was awarded the Spirit of SUPERCAP Award for inspiring others through outstanding acts of service and commitment. “Mike and Paul go the extra mile to deliver superior service on every jobsite they encounter and embody what it means to be part of the LATICRETE family. We’re lucky to have such dedicated and enthusiastic drivers behind our company’s growth,” said Chad Love, LATICRETE SUPERCAP Director of Sales. Allegheny Contract is a full-service applicator responsible for developing the Boston marketplace. Since adopting the LATICRETE SUPERCAP System and the turnkey Ready-Mix Delivery Service that delivers blended SLU through the company’s patented pump truck technology delivered directly to the job site, Allegheny Contract, led by Paul Pappalardo’s efforts, has secured several new contracts and currently operates two trucks. “Paul is an inspiration to our team and serves as a reminder that our most powerful partners are our customers. Paul helps us test new products before bringing them to market, and through his work, we have seen the positive effect the LATICRETE SUPERCAP System has on the building and construction industry,” added Love. NextGen Ready-Mix runs a dedicated Ready-Mix Delivery Service business by partnering with non-union self-performing concrete and general contractors who want to utilize the pump truck technology on their projects. “In just 18 months, Mike has developed a thriving business that has expanded the LATICRETE reach by volumes, introducing SUPERCAP to installers all over New York. No matter the issue at hand, he has a can-do attitude that makes it work and provides his customers with the highest level of satisfaction,” said Love. Recently, LATICRETE acquired the remaining interest in the LATICRETE SUPERCAP, LLC joint venture to fully integrate the businesses under one umbrella and invest additional resources to accelerate growth momentum.